Let us make and publish your magazine apps! Start today! 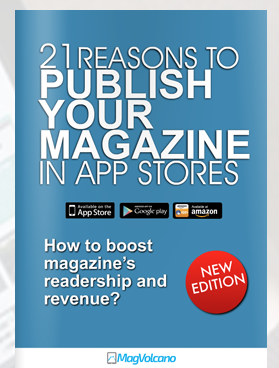 "21 Reasons To Publish Your Magazine in App Stores"
Sell banner ad space and sponsorship. Use magazine app as a lead generation tool. Promote affiliate products and earn commission. Utilize magazine app's communication and marketing features. Use it as a list building tool. is great if you are selling training, courses or other products. Magazines apps can create a passive residual income, because you could be selling them on a subscription basis. download, portable and multimedia enhanced. In the iTunes alone, there are well over 500 Million registered users. You can sell/promote affiliates products or services right from a magazine app or other digital publication. so you promote going green. features like: Push Notifications or GPS coupons. 1. Thanks to the share button integration, users will share your magazine with friends via email or social media. 2. A magazine app is installed on a mobile device’s screen and opened by tapping on the icon. This icon will be seen every time a user turns on the mobile device. 3. Magazine apps are published in app stores which are searched by well over a Billion active users. Each app store has a search box which works similar to Google search box. If your magazine matches the typed keywords - your magazine may show up in the search results and this means huge exposure. enhances the user experience for your readers. view and enjoy your content. Very useful when you are on holiday. you a lot of time and hassle. ads spending grew from 8.8$ billion in 2012 to 35.55$ Billion in 2015. Out of 7 Billion people 6.5 Billion have mobile devices. This is 93% of the population. MagVolcano.com has help us to launch and publish our magazine in no time. Now, we are in the process of creating another magazine. I am very pleased with the cooperation and service we are receiving. We have been using MagVolcano.com for quite a while. They also created our web portal. Going digital is a must these days and MagVolcano.com is the platform to go to. Strongly recommended.